Shirvallah, the Tiger is the new OTK-Card for this! My deck: Nope. Have Forbidden Healing instead. Harrison Jones for a sweet 5 damage and a few cards! Then again, i tried a deck like that and my Holy Wrath drew my Patches the Pirate. Is this how they punish me for not drawing my pirate? Hemet, Jungle Hunter a deck full of less than 3's except Holy Wrath and Molten Giant and either deal 25 damage, or draw a useless 25 cost Molten Giant unless it can be playable. You decide! Quote from Ben Brode "Molten Giant is interesting, because it’s now getting played in Holy Wrath decks." Holy Light, Holy Wrath, Molten Giant - 1 in 3 chance for a 25 to the face! This card is why I'm convinced the Molten Giant nerf isn't all that bad. 25 to the face for 5 mana seems like a good deal! I made a Reno-Paladin deck with one Molten Giant, and boy is it satisfying when I draw him from Holy Wrath. This card is insane in arena, mostly due to luck..
Maybe the crappiest card on all Hearthtone. Holy Wrath on them non-believers. I got this card in Arena. Never used it before and I eat 5 damage to myself. Thank my opponent was very bad and I win easily, but I swore at someone. and that would make the card objectively better. Which is what blizzard didn't want. Ideally, when you use Holy Wrath, you draw something along the lines of the three giants (Molten Giant, Mountain Giant or Sea Giant). The ability to deal 10-20 damage, especially directly against a hero is nothing to be sniffed at. 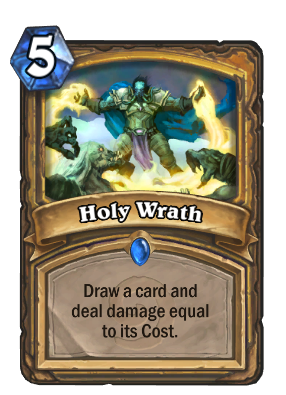 That makes Holy Wrath an excellent end-game card, when you know you have a x% chance to draw one of your giant cards and/or when you have 5 more mana than you have cards to spend. Keep in mind that the card is not destroyed after dealing damage, so you can really only take advantage of this card.